We have had an unexpectedly early summer here in Portland, with temperatures in the 80s in June which is almost unheard of. I’ve lived here for 12 years now have always remembered the grey gloom hanging on throughout the month. Backyards have come alive these past few weeks with garden parties and the trees are heavy with fruit already! 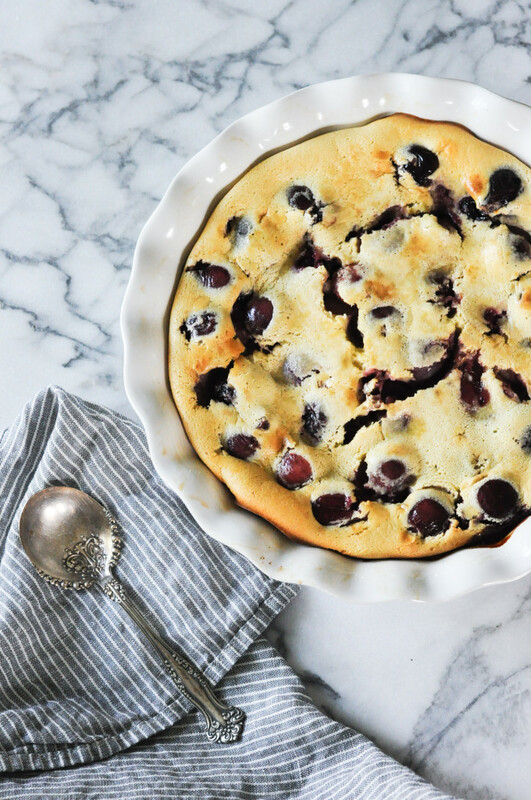 My family came to visit last weekend and I decided to use a beautiful basket of cherries to make a clafoutis for our Sunday dessert. 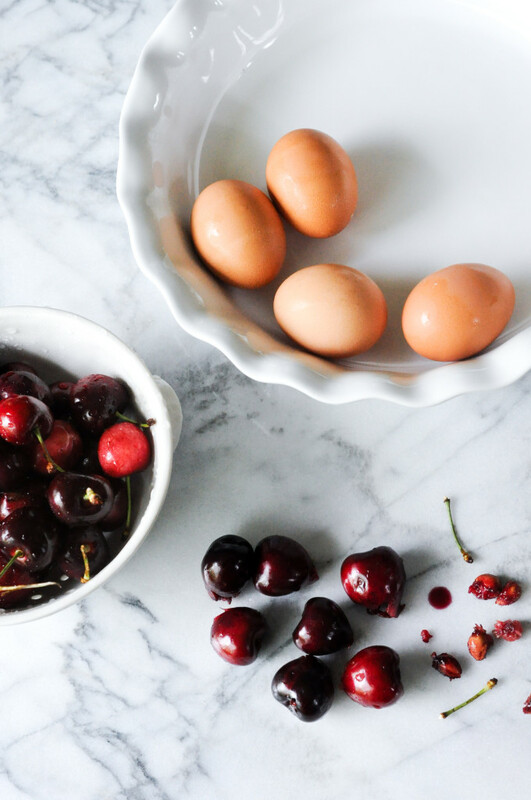 The combination of juicy red cherries and sweet almonds is one of my all time favorites. This is so easy to put together and bakes up perfectly, almost a foolproof dessert. A simple chantilly cream (fancy way of saying whipped cream with a touch of vanilla) is a special touch that definitely tips it into the dessert category, though without the clafoutis is a lovely breakfast similar to a dutch baby. Preheat the over to 350 degrees fahrenheit. Lightly butter an 8 cup baking dish and set aside. In a blender whir up the flour, sugar, pinch salt, milk, eggs, vanilla and almond extracts until smooth. Slowly add the melted butter and blend to combine. Pour 1/4″ batter into the buttered dish and bake for 10 minutes until just slightly set. Remove from oven and sprinkle the cherries in a single layer over the just set batter. 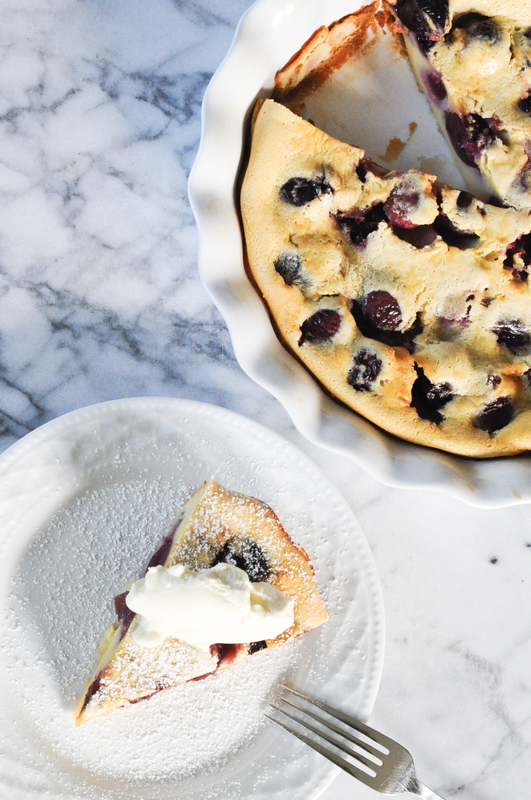 Pour the remaining batter over the cherries and return to the oven, baking for an additional 45-50 minutes or until the clafoutis is puffed and golden brown. Allow to cool and sprinkle with powdered sugar just before serving. Combine the cream, sugar and vanilla in a stainless steel or glass bowl. Using a whisk or mixer beat the cream until fluffy. Do not over beat or you will quickly end up with butter! Top the clafoutis with a dollop of fresh cream and enjoy, hopefully at dusk in the garden surrounded by roses and fairy lights. You know those things you get an intense craving for that can’t be satisfied until you just give in? A big one for me is a piping hot blueberry muffin, fresh out of the oven and overflowing with ripe berries. Yeah I know you need one now. 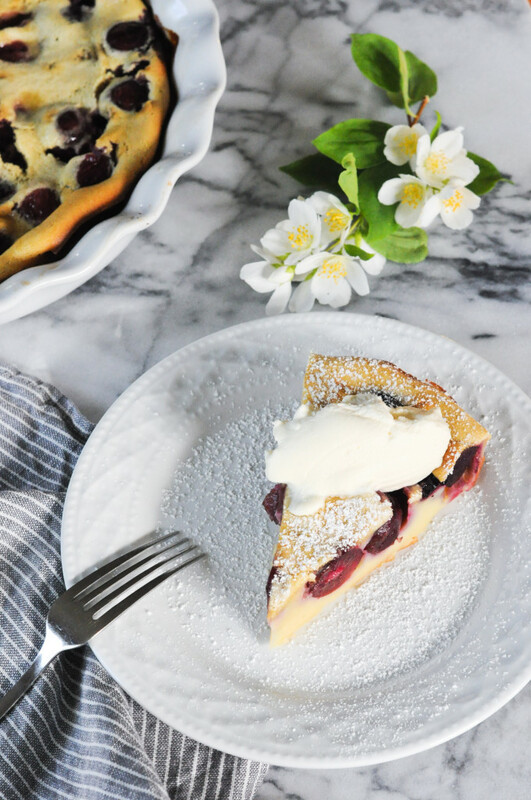 Lemon + blueberries is one of my favorite pairings and you can never go wrong with a little pinch of lavender (especially when summer is so close you can taste it). These are fresh and summery and bursting with fruit, with a light and airy texture and not too sweet. The first time I made them I got a little greedy and added too many blueberries…honestly I did not think it was possible but there is such a thing as too many. Apparently you need a little muffin to hold those berries together! I scaled it back to one heaping cup and that is perfect for twelve muffins, just be sure to divide them evenly when filling the cups. Summer in a muffin, I tell ya! Preheat oven to 400 degrees fahrenheit. Lightly grease twelve muffin cups. In a large bowl whisk together the flour, sugar, salt and baking powder. In a small bowl whisk together the oil, milk and egg and add to the dry ingredients, stirring until just combined. Fold in the lemon zest and blueberries. 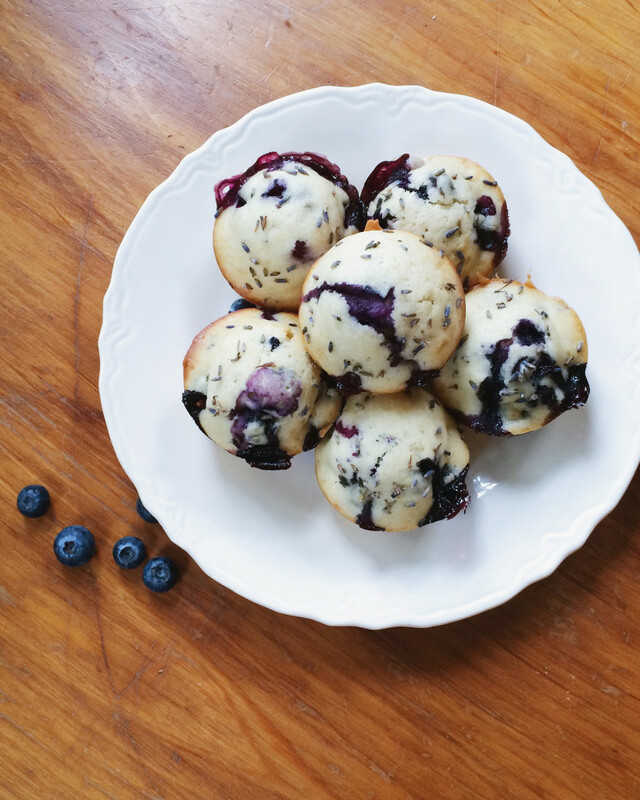 Divide batter evenly into the prepared muffin cups and sprinkle with lavender. Bake for 20-25 minutes until a toothpick comes out clean. Slather with butter and enjoy on a sunny patio with friends. There are some recipes the just look too complicated to even attempt. Popovers were one of those things for me. Growing up my mom would effortlessly whip up a batch and serve them piping hot, dripping with butter and jam. I always thought that something so glorious with their puffed up airy tops, browned flaky crusts and custardy centers would be far above my skill set but as it turns out they are incredibly easy to make if you just follow a few simple rules. 1. Have all your ingredients at room temperature before beginning. 2. Preheat your popover pan for at least 10 minutes. 3. NO PEEKING while they are baking. Do not open that oven door unless something is on fire. Simple enough, right? Follow these rules and you will be rewarded with an impressive Sunday treat to serve your family and friends. Most people don’t know these rules and will therefor think you are some kind of Paris trained pastry chef but really you just listened to me and that is funny and a lot less expensive! 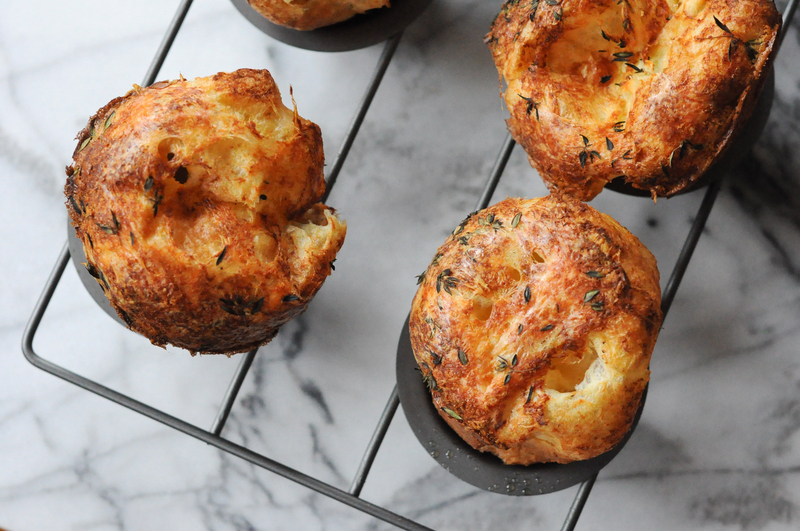 I had a craving for something savory so I added nutty gruyère cheese and fresh thyme to mine feel free to leave those out if you are a purist and prefer a traditional popover served with nothing more than a little butter and maybe a smidge of jam. Or you could be a complete genius and double the recipe and have both! That is my kind of popover party. Preheat your oven to 425 degrees. Place popover pan* on center rack for 10 minutes to heat. Meanwhile, combine eggs, milk, nutmeg and one tablespoon of melted butter in a bowl. In a separate bowl whisk together the flour and salt. Add the egg mixture to the flour and whisk well to combine, resulting in a very smooth batter. 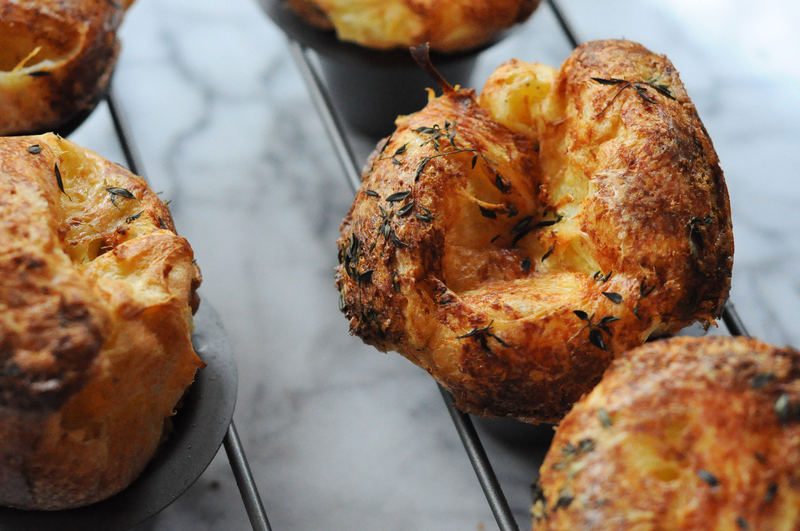 Take the popover pan out of the oven and divide the remaining melted butter among the cups, following with the batter. Sprinkle the cheese and thyme on top and bake for 30 minutes. Great served on their own or alongside a nice Sunday roast. 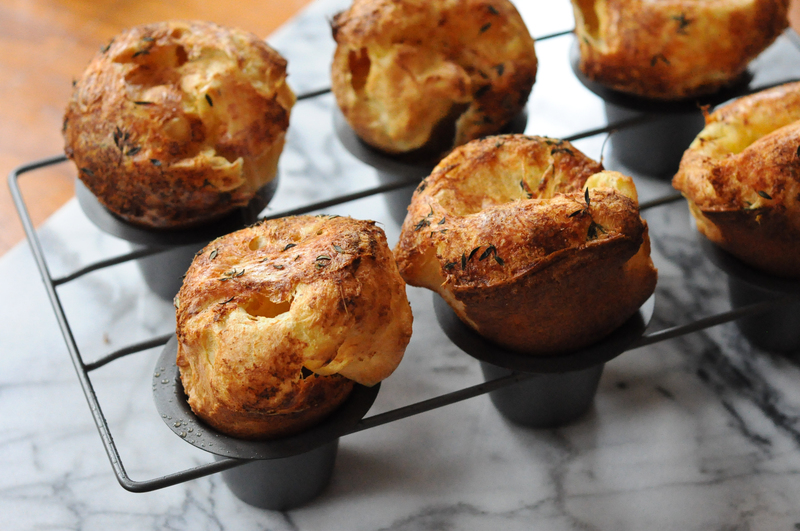 *you can substitute a regular muffin pan but a popover pan is highly recommended for maximum height and airiness! While I haven’t made any new year resolutions involving my diet I have felt compelled to eat things that are not made entirely of butter and sugar. The past few months have been indulgent, to say the least. 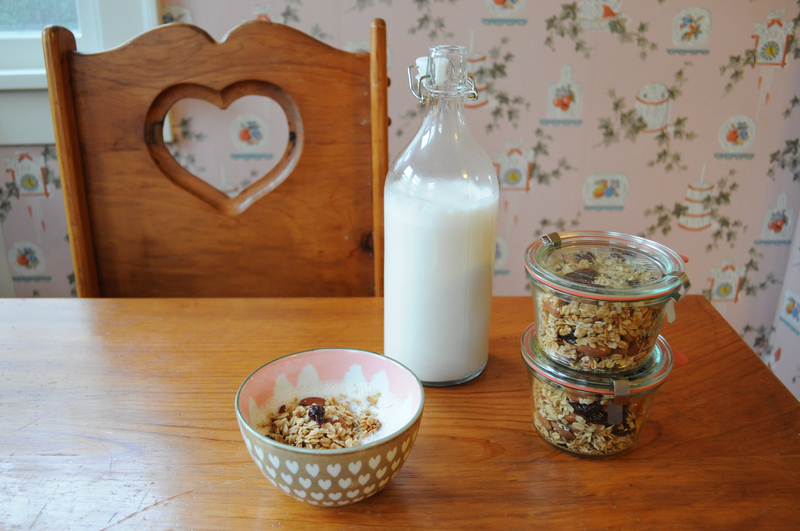 Homemade granola is one of my favorite breakfasts, it is so easy to make a large batch to have on hand for something quick and healthy in the morning. This version is lightly scented with cardamom and studded with bright, tart dried cherries. This recipe includes an egg white (to help create the clumps) but could easily be omitted to make the recipe vegan. I kept the sugar level really low but it can be increased if you have a sweet tooth. I like mine with some freshly made cashew milk or plain yogurt drizzled with honey. 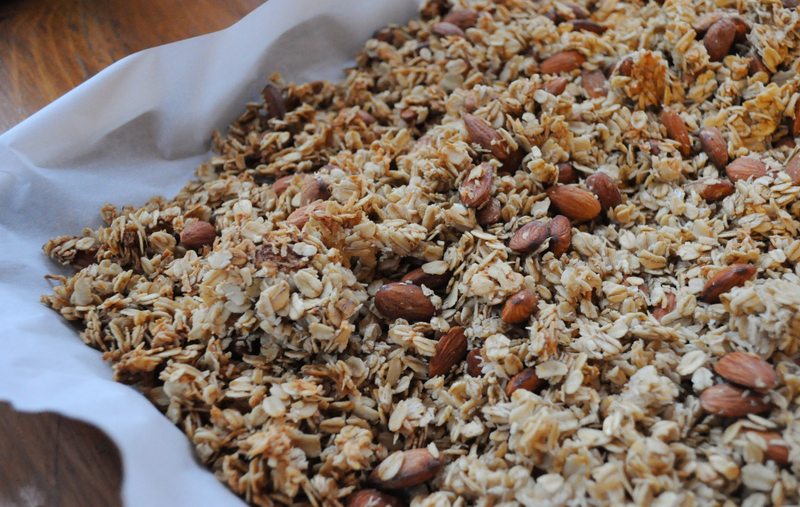 If you have never made granola you have to try it – so easy and nothing like the stuff you buy in the store! Preheat the oven to 300 degrees. 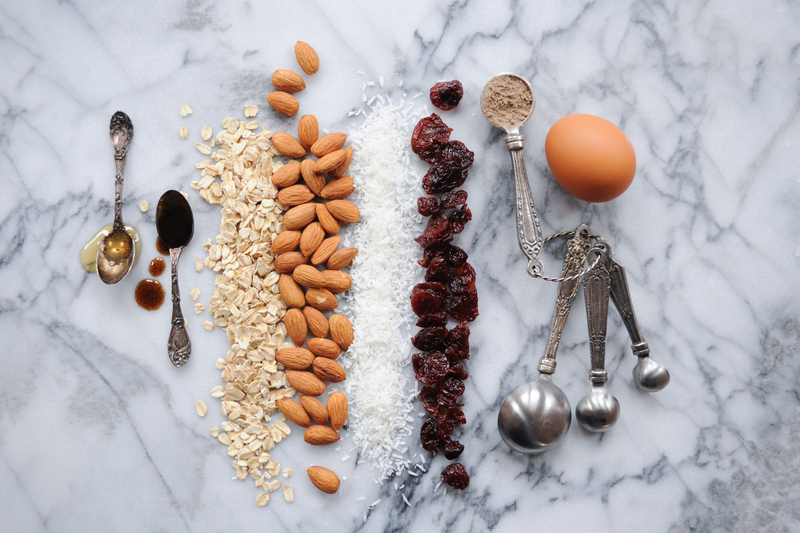 In a large mixing bowl combine the oats, shredded coconut, almonds, cardamom and salt. Add the coconut oil (heat it over the stovetop or in microwave to liquify) and maple syrup. Lightly beat the egg white with the vanilla, add to the oats and mix well to combine. Line a baking sheet with parchment paper and spread the oat mixture on the pan. Bake for 45-55 minutes, turning once with a spatula halfway through. The granola is done when it’s a beautiful golden brown color. Let cool and then break up the clumps to your liking and sprinkle in the cherries. Store up to two weeks in an airtight container. These cookies are pretty alright. Just kidding! These are the best cookies I have ever stuffed into my mouth, you should stop whatever you are doing and get some butter softening to make them IMMEDIATELY! Seriously, so good. The nutty brown butter with bittersweet chocolate and sea salt is a holy trifecta that can’t be beat. 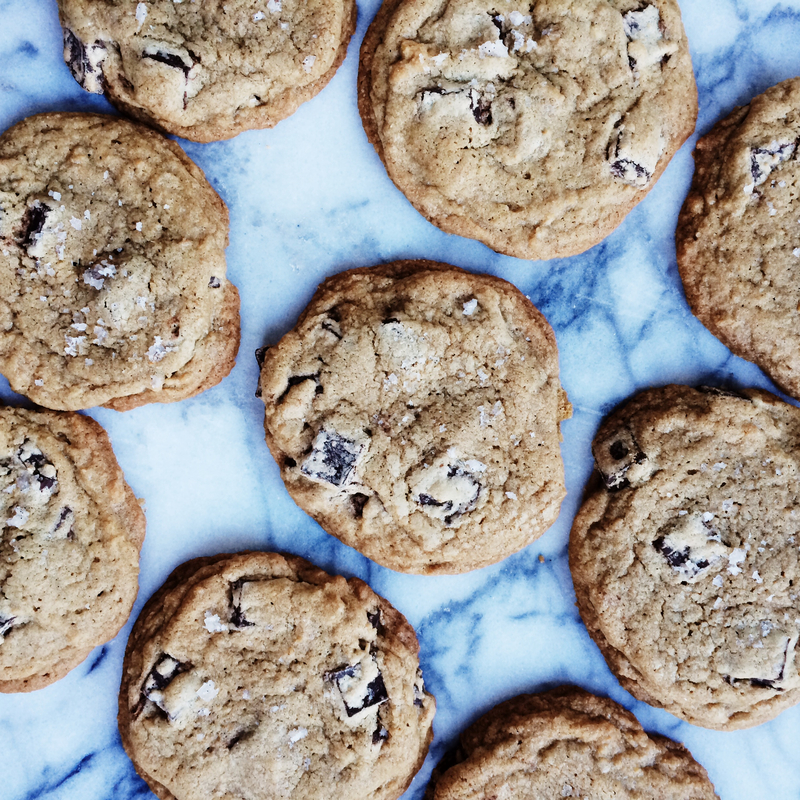 I used this recipe from Joy the Baker and made the following changes: dark brown sugar instead of light because that is what I had in my pantry, whole wheat flour, added an extra 1/2 cup of chocolate chips and this magic vanilla sea salt* instead of regular old boring salt. You could totally make your own by combining a little fleur de sel with a piece of vanilla bean in a small jar and letting it chill out for a while. Happy cookie baking! *also delicious sprinkled on top of oatmeal, trust me. I dreamed this up when I was in a moment of snack desperation yesterday and it is going to be my new go-to! Would also make a lovely appetizer at a party. 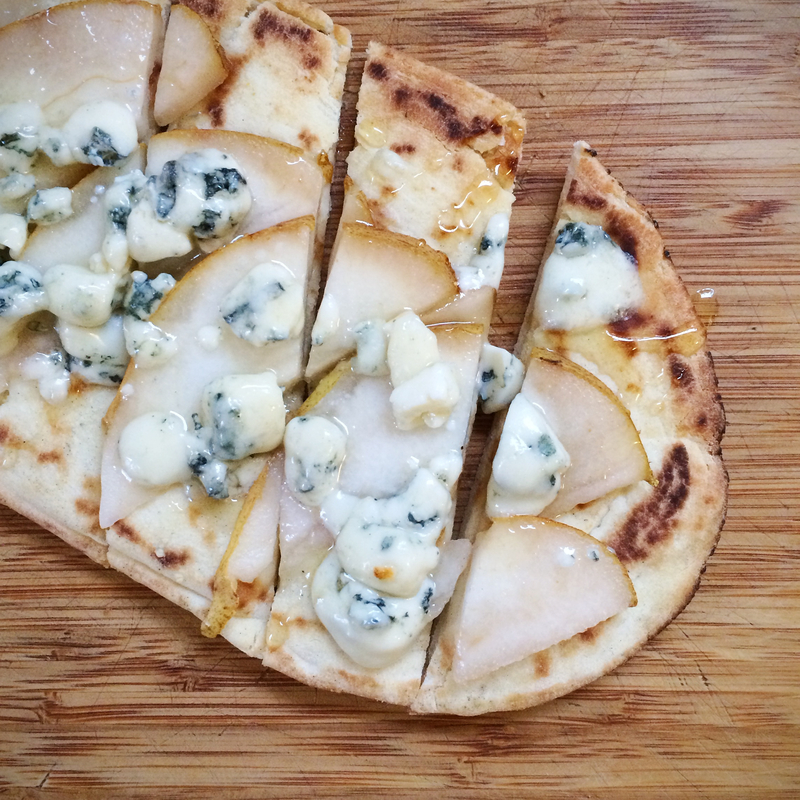 Simply toast a piece of flatbread (I used a piece of naan leftover from an indian dinner earlier in the week) and top with thinly sliced pear and crumbled gorgonzola. Pop back into the oven to broil for 30 seconds until the cheese has melted and drizzle with honey. Slice into pieces and serve warm. SO GOOD. 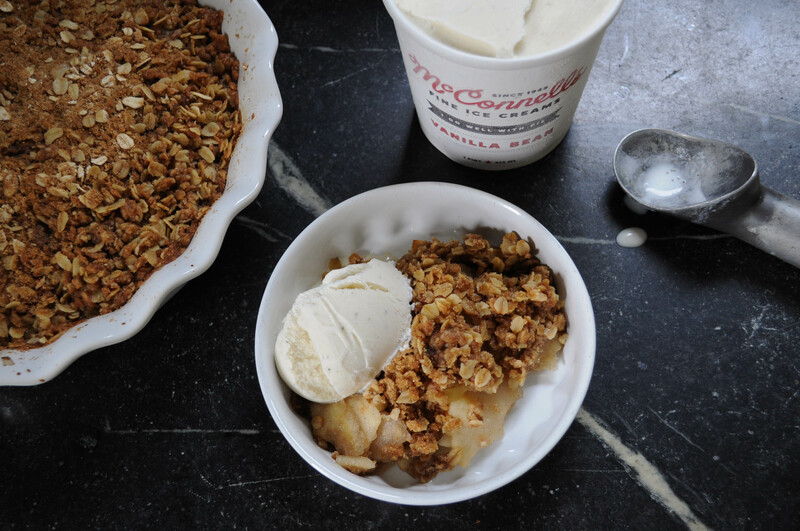 I would take apple crisp over apple pie any day. I might be a bit biased as I grew up on the stuff but in my mind the crunchy oat topping is the perfect match for sweetly spiced apples. Served warm with a scoop of vanilla ice cream it just can’t be beat. Leave off the ice cream and you can almost get away with eating it for breakfast! Almost. This recipe is based off the one my mom gave me (thanks mom! ), spiked with bourbon and a touch of vanilla. 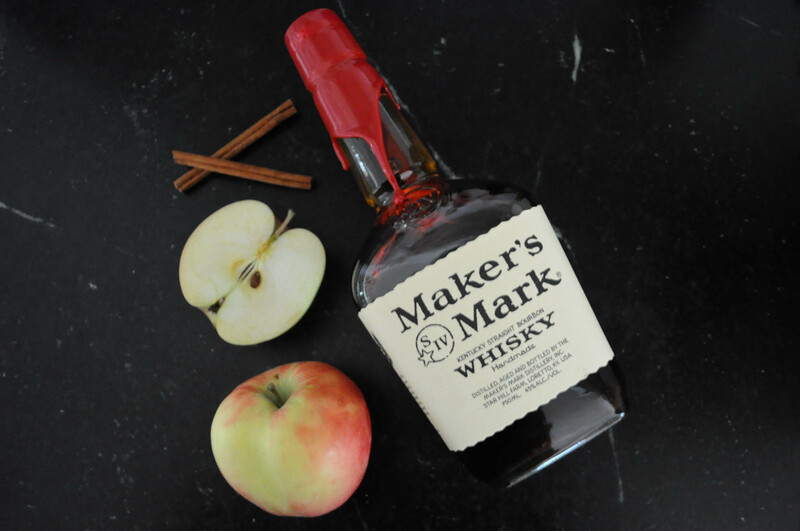 Because you can’t go wrong with bourbon. Extra points for picking your own apples but totally not necessary. 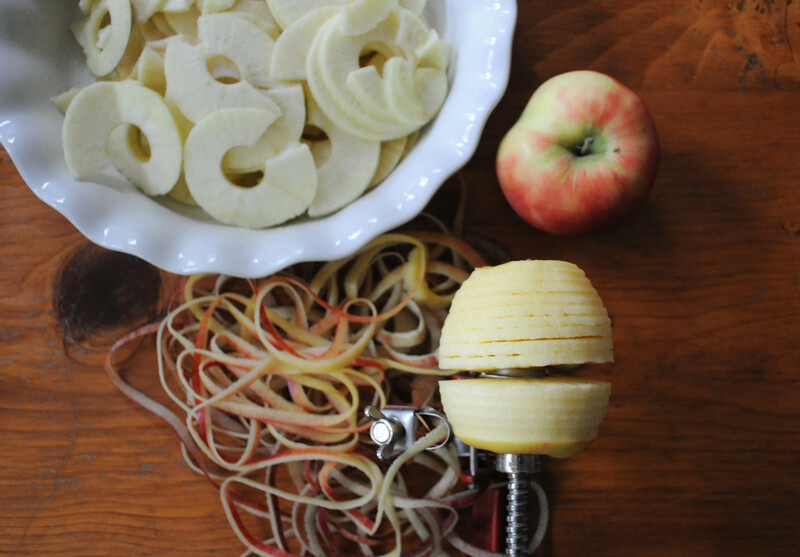 If you make at least one apple dessert a year I highly recommend investing in an apple peeler/corer/slicer, they are magic! Lightly grease an 8×8″ baking dish or 9″ pie dish. Peel, core and slice apples thinly. Toss with lemon juice, bourbon and vanilla and pour into the baking dish. In a mixing bowl combine the flour, oats, brown sugar, cinnamon and pinch of salt. Cut the chilled butter into the flour and oat mixture until it forms a crumb approximately the size of small peas. 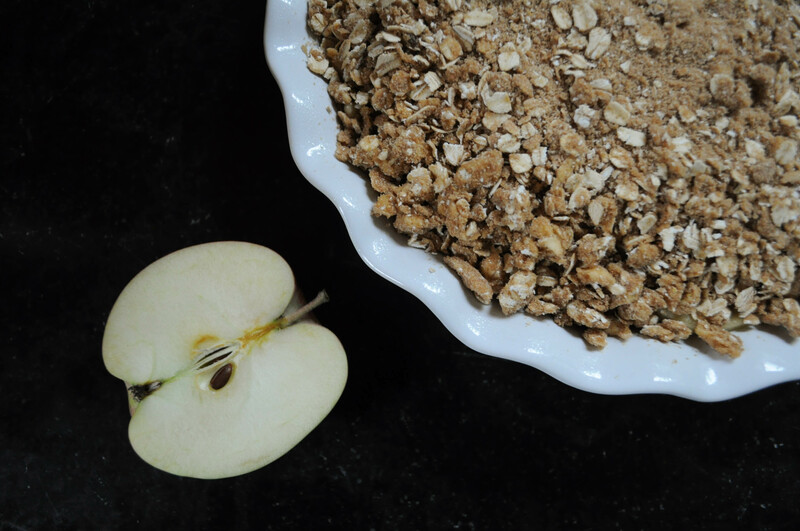 Top the apples with the oat mixture and bake in a 350 degree oven for 35 minutes. Serve warm with a scoop of vanilla ice cream. They need to change the saying to “easy as crisp”. Simple to make and really easy to eat! Enjoy. October might be my favorite month for cooking. There’s still an abundance of vegetables and fruits at the farmers market and the dip in temperature means it’s time for slow cooking, roasting, glazing and caramelizing. There are few things better than coming home from a long day to a house filled with the scent of a thoughtfully prepared meal. 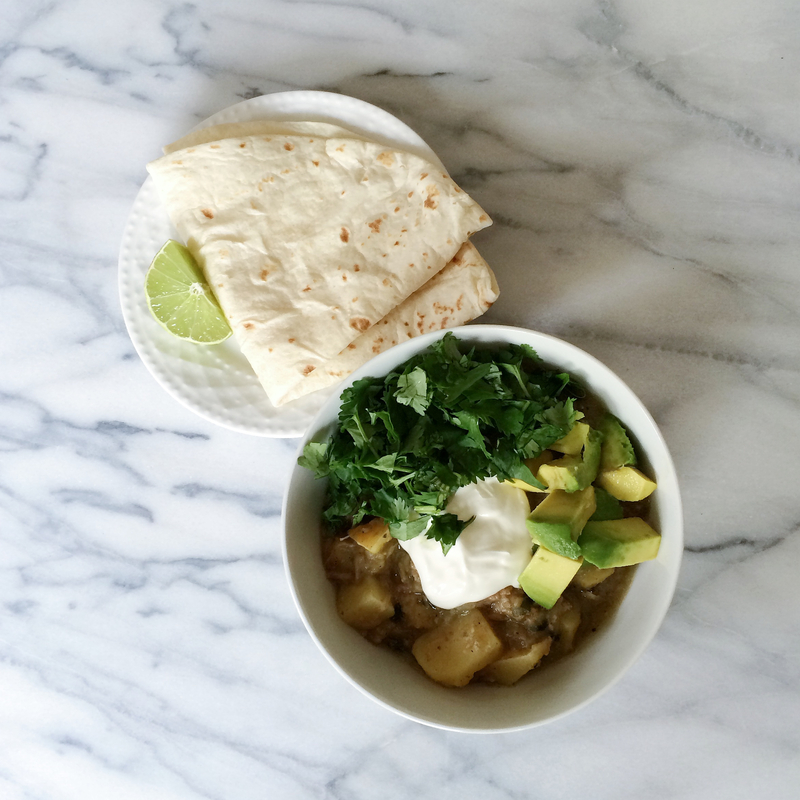 This recipe for tender pork and chile stew gives you that with minimal prep; it’s easily assembled in the morning and waiting to warm your belly when you get home. The most complicated part of this recipe is roasting the chiles but you can easily just throw them on the barbecue when you’re grilling up dinner the night before (that’s what I did). Even better, just open a can of roasted chiles. Don’t worry, I won’t tell Martha. This was one of those recipes that I found myself saying “I can’t believe how good this is” the whole time I was eating it…and again the next night and the night after. It is at once comforting and bright and is going to be on heavy rotation in this house once the cold settles in. Easy and impressive, my favorite. Cut pork shoulder into 1 inch cubes and quickly sear in a hot skillet coated with olive oil. Add onions and cook until pork has browned on all edges, about 5-10 minutes. Layer the pork and onion mixture into the bottom of a slow cooker. Sprinkle the bay leaves, cumin and oregano on top. In a vitamix or food processor combine the tomatillos, chiles, garlic and chicken stock and blend until smooth. Pour over the pork mixture and top with potatoes. Set the cooker to low for 8 hours and get on with your day. When it’s time to eat give it a stir and season with salt and pepper to taste. Serve with warm tortillas and top with avocado, a dollop of sour cream, fresh cilantro and a squeeze of lime. I am very particular about my bananas. I don’t fancy myself a picky person in general but when it comes to bananas, definitely. I like them to be uniformly yellow, perhaps the slightest tinge of green on the ridge or one or two spots but that’s it. Anything more and they go into the freezer for smoothies or mashed up and baked into muffins or bread. While browsing the late summer vegetables at my local farm stand I noticed a sign stating zucchini were 4 for $1. These weren’t your average zucchini, they were as big as my forearm. Never one to pass up a deal I loaded up my basket and headed home. I grilled them and sauteed them but after a few days I still hadn’t made much of a dent. I looked over at the sad brown speckled bananas and the sugar receptors in my brain sparked! Everyone knows if you add a vegetable to a sweet it becomes “healthy”, right? In an effort to keep this on the breakfast side of things rather than dessert I decreased the sugar and substituted coconut oil for the usual canola. The addition of pumpkin pie spice adds delicious fall flavor – I just love the blend of cinnamon, nutmeg, ginger, allspice and clove. This is the best slightly toasted and slathered with butter. Preheat oven to 350 degrees. Toast walnuts until just fragrant. Grease two loaf pans and set aside. Combine the eggs, brown sugar and white sugar until thoroughly mixed. Add coconut oil and vanilla and blend. Mix in the mashed bananas and zucchini. In a separate bowl mix the flour, baking powder, baking soda, pumpkin pie spice and salt. Slowly add the dry mixture to the wet in stages, mixing as you go until just combined. Mix in the toasted walnuts and distribute the batter between the two pans. Bake for 50 minutes or until a toothpick comes out clean. 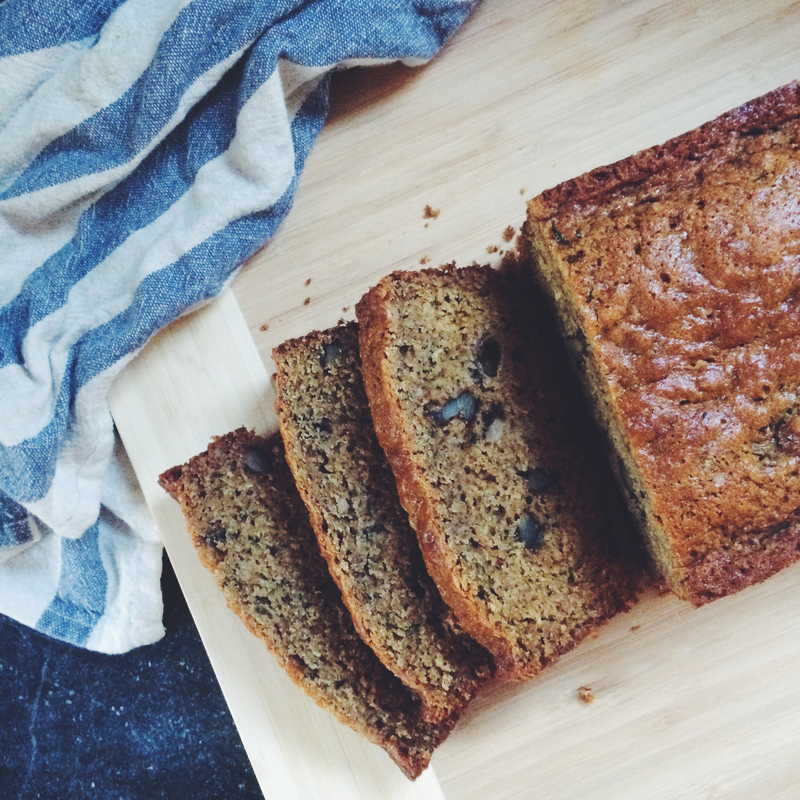 Share a loaf with a lucky friend or freeze for to enjoy later. A few weeks ago my friend Jen and I headed out to Sauvie Island to spend an idyllic day picking dahlias and fresh peaches from the trees. It was a scorcher around these parts with the temperature hovering around 90 but we slathered on as much sunblock as possible and took our ex-goth selves out into the fields. We ended up with a large bucket of dahlias and headed across the street to the peach orchard. Unfortunately the farm we went to was very picked over but luckily we managed to gather enough for one perfect summer dessert. I thought about making a pie but my laziness got the best of me. Something about rolling out the crusts to perfectly stretch over the pie plate, crimping and weighting and blind-baking just felt like too much. 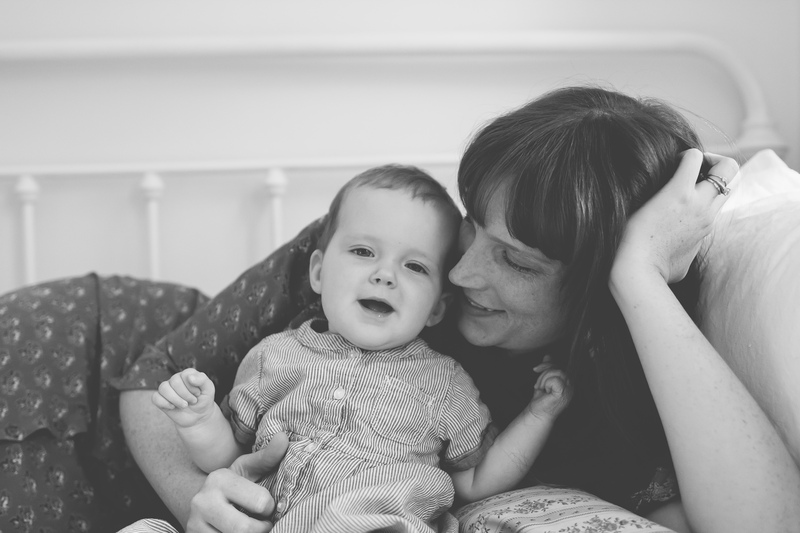 Perhaps my pre-baby self would have been more ambitious but I needed quick and easy. I needed a galette. I’ll save pies for blackberries and pumpkins. 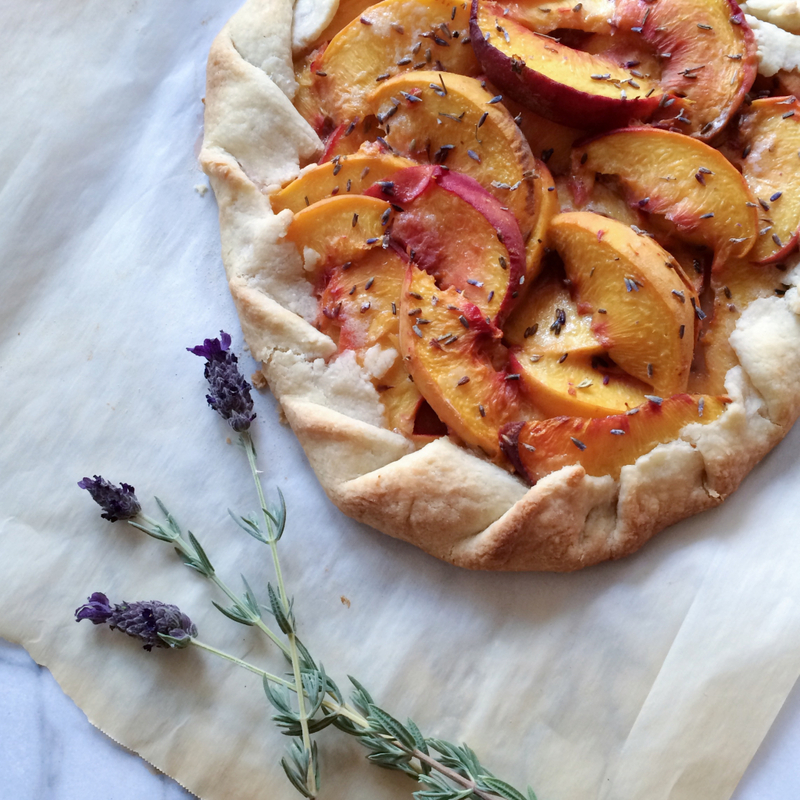 I am now convinced that a galette is the only way to go with stone fruit. You simply make a basic crust, roll it out, stuff it with fruit and fold over the edges. I started arranging the fruit in a beautiful fan pattern but quickly dismantled it and tossed them into the crust haphazardly. That’s the beauty of this simple dessert, the more rustic the better. Combine the flour, sugar and salt in a food processor. Add cubed butter and pulse until a small crumb forms. Slowly drizzle in the ice water while processing to combine until just formed. Form the dough into a ball, press into a disk and refrigerate for an hour. 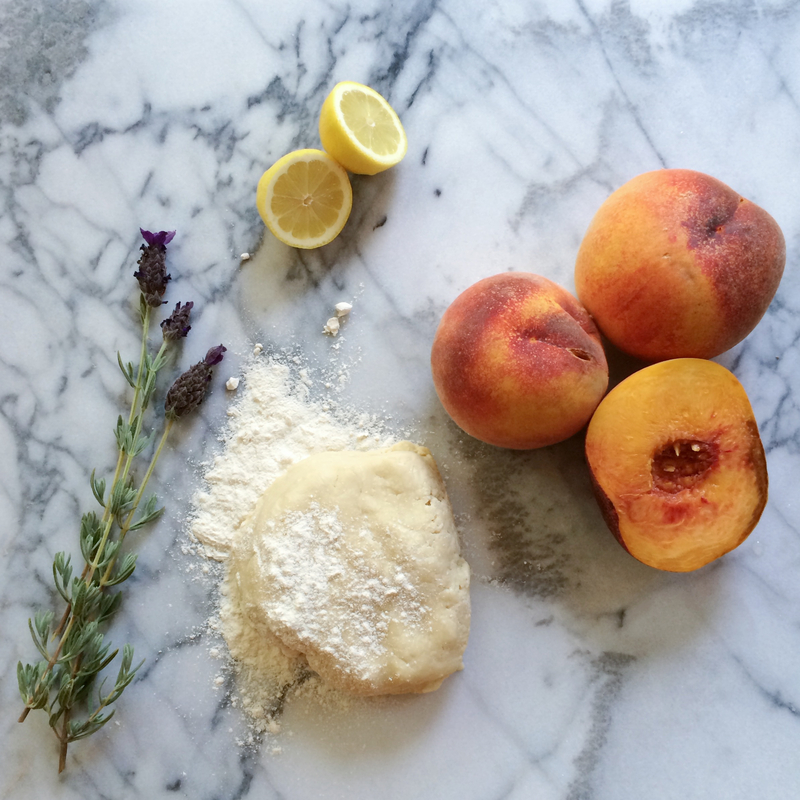 In a large bowl combine the peaches, lemon zest + juice, flour, sugar and lavender. Roll out the dough into a circle 1/4″ thick. Pour the peaches into the center of the crust and gather the edges up around the filling, slightly overlapping and crimping as you go. Dot with butter and bake at 450 degrees for 25-30 minutes. You’ll know it’s done when your house smells incredible and the crust is golden brown. Let cool before slicing and serve with a scoop of vanilla ice cream.